Some of the gear you will need for the MYAU can be very expensive if you have to buy it. Other gear you may only need once or may not want to transport it all the way to the Yukon and back. Rental gear can be a good solution. Also, if you have any questions or concerns, please let me know. All below rental prices include tax and are regardless of the race distance you signed up for. If you participate in one of the survival courses taking place in the Yukon immediately prior to the race, there is no extra charge and the gear will be available for your course. Rental gear that is returned damaged will be invoiced at the full recommended retail price (rental fee deducted). P.S. Another way to save some money may be to buy or borrow used gear from athletes who have done the MYAU already. The best place to get in touch with participants from past years is our group on Facebook. For rental sleds we mainly use the Northern Sled Works Siglin Pulk which is made in Fairbanks, Alaska. For details and features please check out our section on Pulk Sleds. 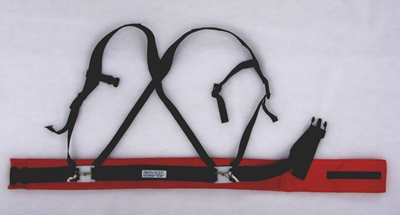 The rental sled comes with poles but without a harness, cover or bag. We also have a limited number of Snowsled sleds available for rent. The rental price is the same. If you prefer this type of sled please let us know. If you would like to buy Snowsled equipment, please go to www.racelite.com. Racelite also sells Siglin Pulks. If you are interested, please get in touch. Bear in mind that you may well feel more comfortable wearing your harness slightly lower than your waist, possibly at hip level. The sizes above allow for thermal and shell clothing layers. The belts use a duel density foam layer within a hard wearing Cordura cover, the softer foam being on the inside. At times you may find it more comfortable to haul with the waistbelt loosened. Adjustable shoulder straps are a double layer of 50 mm webbing, with a moveable and adjustable chest strap to ensure a comfortable fit. Standard harnesses are designed for hauling by either ropes or rigid shafts – our rental harness will have both. 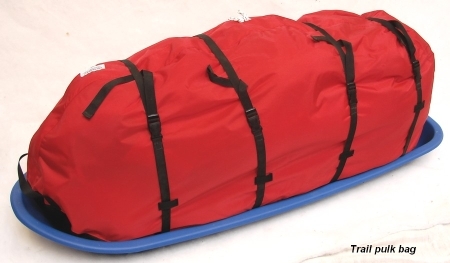 This sled bag weighs 1.15 kg and has a capacity of 250 litres. Rental is EUR 49.00. If you would like to buy a Snowsled sled bag, please go to www.racelite.com. Carinthia is an Austrian specialist company for producing sleeping systems and insulated clothing for cold weather. Their D1200x is great for the Montane Yukon Arctic Ultra. Including a rugged compression stuff sack from. The rental sleeping bag does NOT include a bivouac bag nor sleeping mat or liner. The regular sales price is EUR 1,149.99. The rental fee is EUR 250.00. If you would like to buy the Carinthia D 1200x please go to www.racelite.com. Thanks to Primus you can also rent the OmniLite Ti which is probably the best expedition multi-fuel stove on the market. It may help you save some cost and it certainly will help you avoid the headache of taking a stove with you on a flight. The rental package also includes a Primus Eta pot 1.0 l and a Primus Powerlighter. The RRP of all these products together is EUR 284.85 (stove = EUR 229.95 / pot = EUR 24.95 / lighter = EUR 19.95). The rental is EUR 80.00. You can have the world’s best sleeping bag but if your sleeping mat is not good, your system will fail and you will be very cold. With the Exped DownMat XP 9 we rent out one of the warmest and most comfortable sleeping mats on the market. It has got an R-value of 8 and a temperature rating down to – 38° Celsius. A thickness of 9 cm and high quality down insulation, mixed with air, mean that you are far away from the cold ground and have the best possible addition to your super warm sleeping bag. The Exped DownMat XP 9 (size M) measures 183 x 52 cm, weighs 895 g (plus a 60 g pumpbag and a 22 g pack sack) and has a packed size of 24 x 16 cm. It retails for EUR 219.95. Rental is EUR 60.00. Upon request we can also rent out the larger size (LW) which measures 197 x 65 cm. If you would like to buy the Exped DownMat XP 9 please go to www.racelite.com.